With the power, effectiveness, and reliability the 12 gauge shotgun offers, you have just the short range firearm you need. Great for hunting, self defense, sports shooting, and law enforcement applications, the 12 gauge is a very versatile firearm. Since 1866, Winchester has been influencing the firearms and ammunition industry. 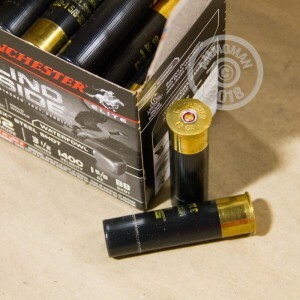 As one of the oldest ammunition manufacturers in America, Winchester has a reputation for producing high quality products that are also reliable. 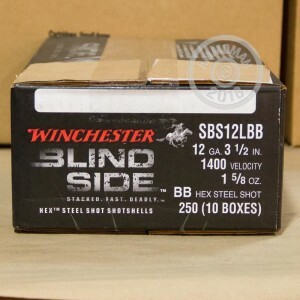 These Elite Blind Side shells are perfect for hunting large waterfowl. Each hull measures 3-1/2" in length and carries a 1-5/8 ounce column of BB hex steel shot. These shells have the design and power you need to make your next hunting trip a success. 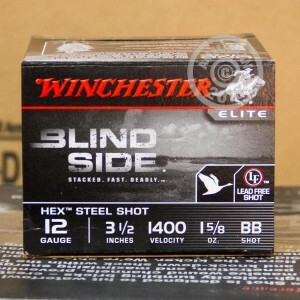 Pick up a few boxes of this premium Blind Side ammo from Winchester, or any other products totaling $99, and you will receive Free Shipping!